An eighth clean sheet in 13 Premier League games helped Liverpool to an ultimately comfortable 3-0 win at Vicarage Road, although they had to ride their luck as they stayed hot on the heels of Manchester City. 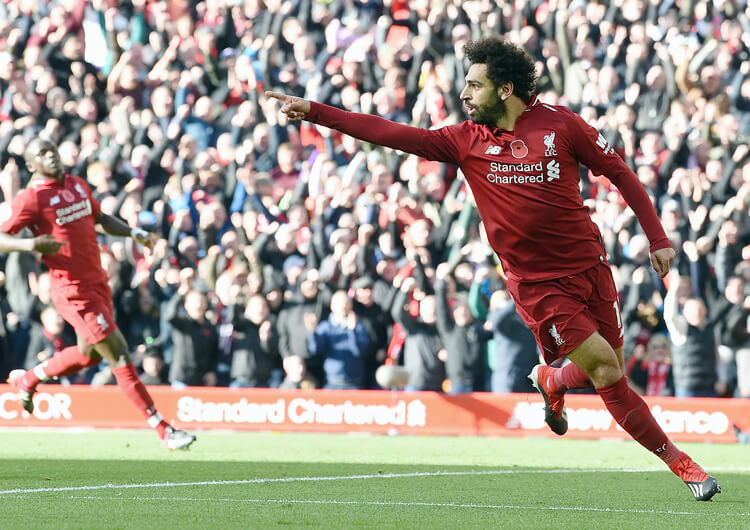 After a goalless first half, hosts Watford thought they had a penalty when Andy Robertson looked to have fouled Will Hughes in the Liverpool area – but the visitors escaped and took the lead midway through the half when Sadio Mane escaped the home defence to play in Mo Salah for his seventh league goal of the season. Trent Alexander-Arnold doubled the lead with a well-struck free-kick, and Roberto Firmino headed a third late on despite Liverpool having been reduced to 10 men through the dismissal of captain Jordan Henderson. The defeat sees Watford drop to ninth in the table. Javi Gracia set his Watford team up in a 4-4-2 formation, with Will Hughes, Etienne Capoue, Abdoulaye Doucoure and Roberto Pereyra across midfield and Gerard Deulofeu partnering Troy Deeney in attack. The hosts were happy to concede possession for the majority of the game, and soak up Liverpool pressure before trying to hit them on the counter-attack. They had some early chances through this strategy, but the detail of the passes was often lacking – the ball regularly fell short or was overhit. Watford’s other method of attack was to play direct to Deeney, for him to hold the ball up and bring others into play. The powerful forward positioned himself against Dejan Lovren rather than Virgil van Dijk – and he did enjoy some success against the Croatian early on, but the Liverpool defence were able to deal with him better as the game progressed. The hosts were mostly shown wide, but they struggled to create anything of note with Liverpool cutting off inside options well – and van Dijk dealt easily with anything that came into the box in the air. Upon regain, Watford would try to play forward early but struggled to secure good possession as a result of Liverpool’s counter-press – although there were also several occasions where Watford gave the ball away simply through lack of quality. The Hornets also had a problem when they fell into a low block and managed to clear the ball, as there was nobody positioned higher up the pitch to secure possession. 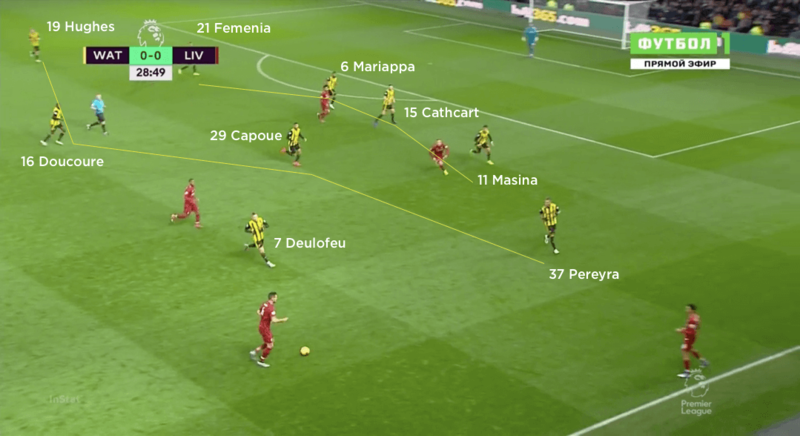 With everyone involved in the defensive phase, Liverpool effectively had Watford pinned back and could attack at will. Out of possession, Watford set up in a very organised 4-4-2 mid-low block. They looked to nullify the threat of Mo Salah and Sadio Mane by reducing the space in behind their defensive line, thus making it difficult for Liverpool to release their forwards in behind. Goalkeeper Ben Foster was proactive in coming off of his line to deal with anything that did find its way behind the defensive unit. The hosts mainly looked to protect the central areas and leave the Liverpool full-backs free out wide. 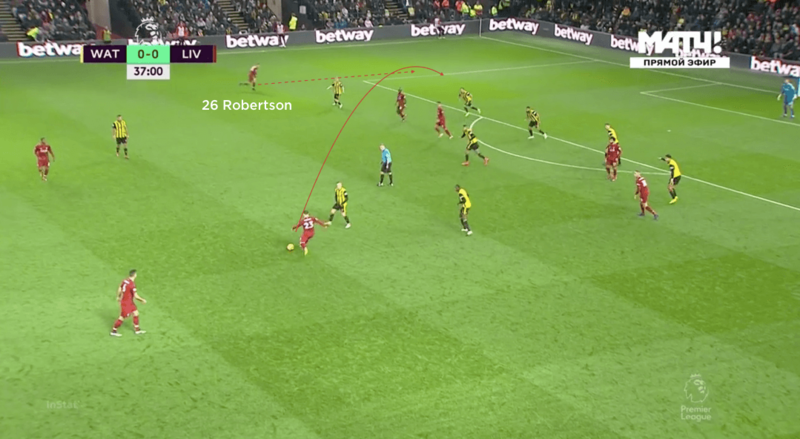 As the ball made its way to either Trent Alexander-Arnold or Andy Robertson, the wide midfielder would go out to engage, while the nearest of the two strikers would cover inside to prevent the ball being returned and then played through the space left by the wide midfielder. 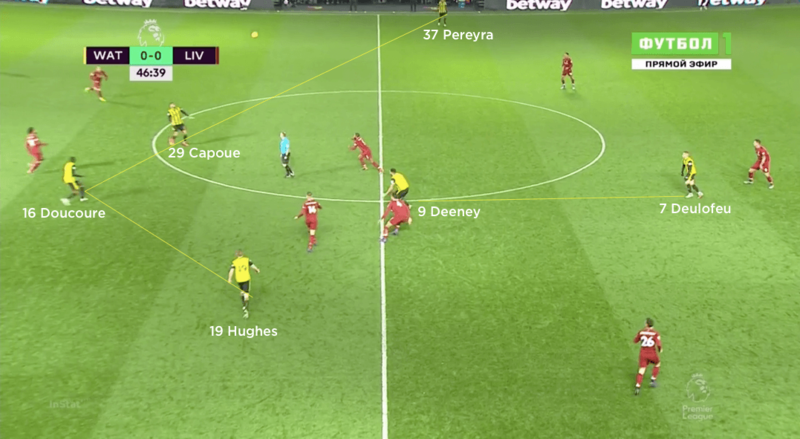 When Liverpool began to move their full-backs into higher positions, the Watford full-backs would press them and leave Pereyra and Hughes to track the runs of Xherdan Shaqiri and Sadio Mane into the space vacated by the full-back. This allowed Watford to keep centre-backs Adrian Mariappa and Craig Cathcart, and the far-side full-back, in position to defend the box, with Doucoure and Capoue in front of them. Unfotunately for Watford, it was in this area that Liverpool scored their opening goal. 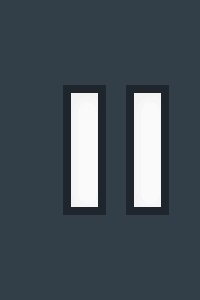 Femenia had moved to press Robertson and Hughes had tracked Mane, but when the ball was returned inside to Firmino, Hughes turned to look towards the ball – Firmino was able to play through the gap for the escaping Mane, who squared for Salah. This was perhaps the only time in the 90 minutes that Watford allowed Liverpool through their defensive structure, but it proved fatal – as the hosts pressed for the equaliser, the Reds were able to add two more goals through a free-kick and a late counter-attack. 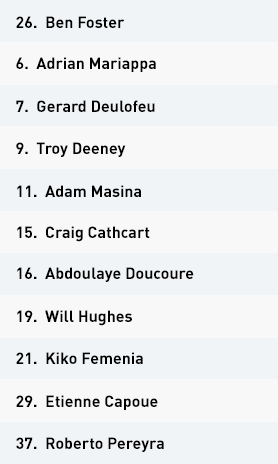 Watford set up in a 4-4-2 formation in possession, with Gerard Deulofeu supporting Troy Deeney in attack. 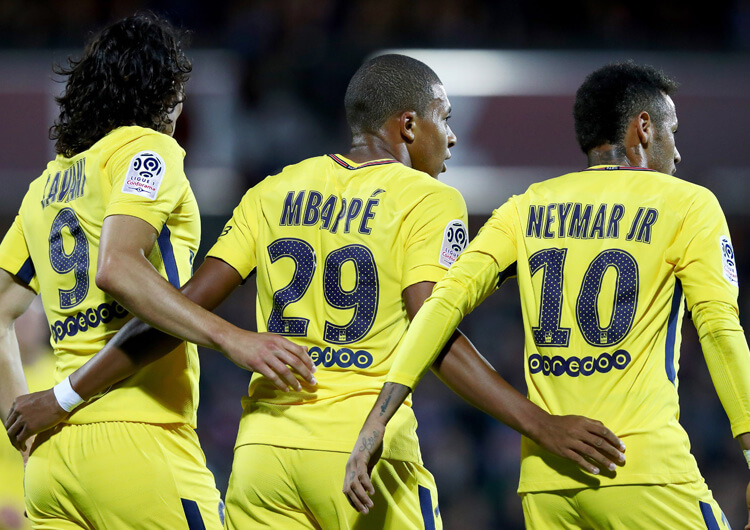 The hosts looked to play direct to the latter on regular occasions. Javi Gracia’s men used a 4-4-2 mid-low block out of possession. 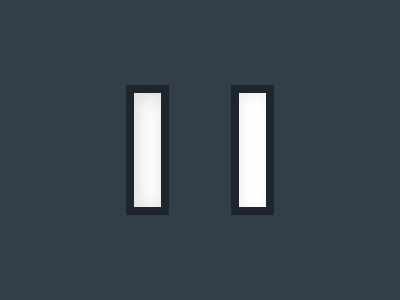 They worked to protect central areas and reduce the space between and in behind their defensive units. 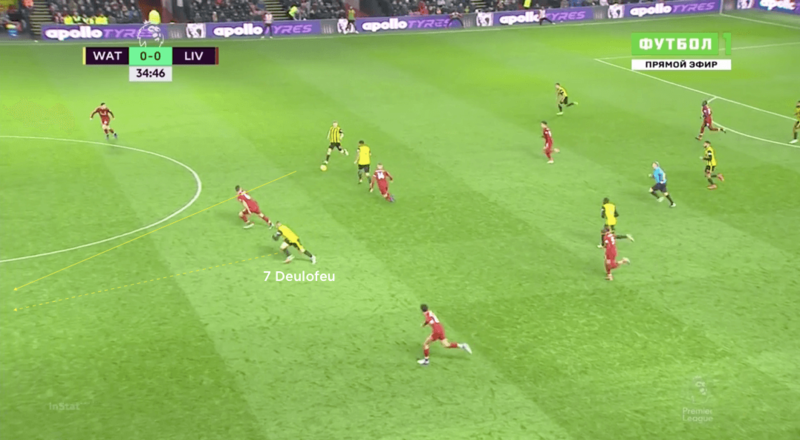 Watford attempted to utilise the counter-attack as an offensive strategy, but their passing in transition often lacked the quality to cause a composed Liverpool defence any real concern. The hosts’ defensive strategy in wide areas was mostly well organised, but mismanagement of screening between Will Hughes and Kiko Femenia opened a gap for Sadio Mane in the build-up to Liverpool’s first goal. 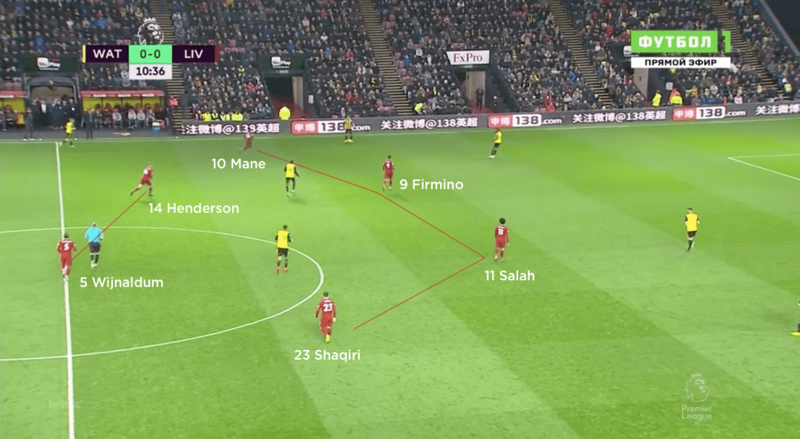 Liverpool used a 4-2-3-1 formation in possession, with Sadio Mane, Roberto Firmino and Xherdan Shaqiri supporting Mo Salah in attack. The Reds pressed high out of possession, and tried to show Watford into wide areas as much as possible. 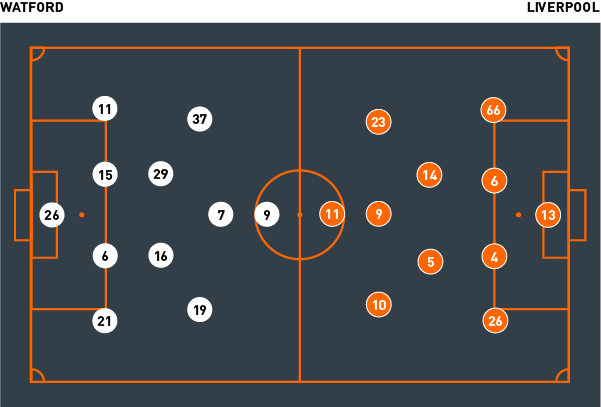 The visitors would look to lock on to Watford’s players once possession was forced out wide, and effectively create a 7-against-6 in a small area of the pitch where they could regain the ball. 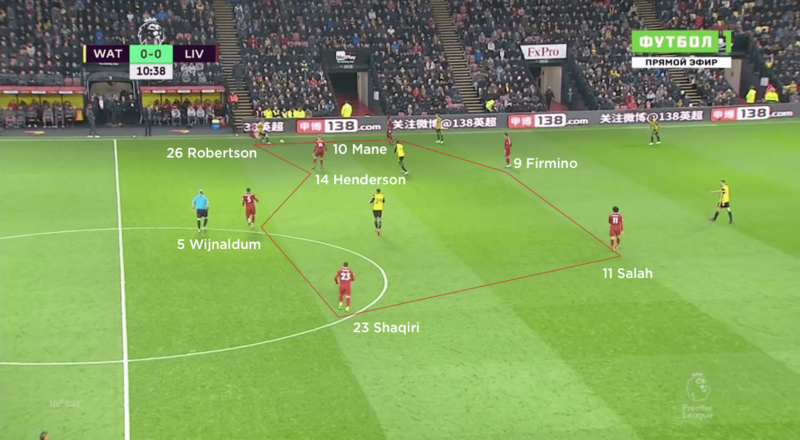 Liverpool found limited space for their forwards to run in behind, so they began positioning their full-backs higher and trying to exploit the space behind Watford’s full-backs. 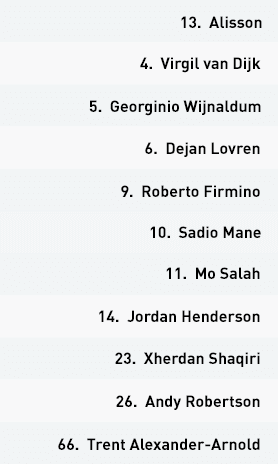 Jurgen Klopp set his Liverpool team up in a 4-2-3-1 formation in possession, with the returning Jordan Henderson and Georginio Wijnaldum in central midfield. 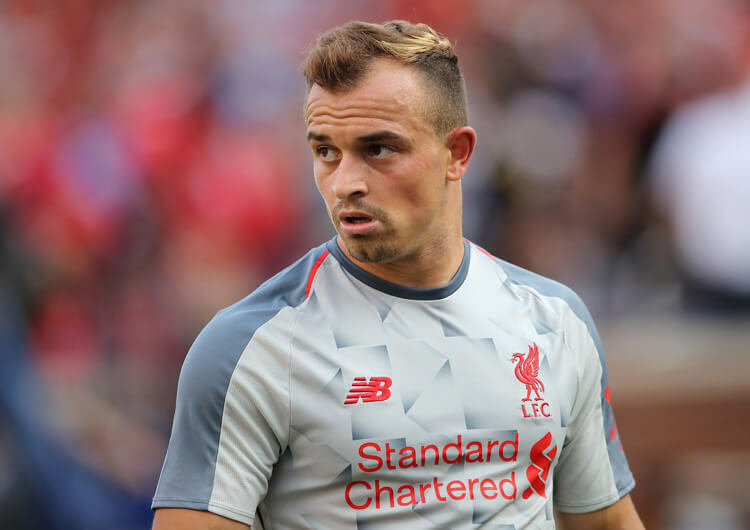 Xherdan Shaqiri, Sadio Mane and Roberto Firmino supported Mo Salah in attack. Liverpool were allowed to dominate possession and were tasked with breaking down an organised 4-4-2 defensive structure. They looked to try to release Mane and Salah in behind the Watford defence, but found space limited with small distances between the Watford units and goalkeeper Ben Foster. As a result, lots of possession was circulated between Henderson, Wijnaldum and the Liverpool back four. 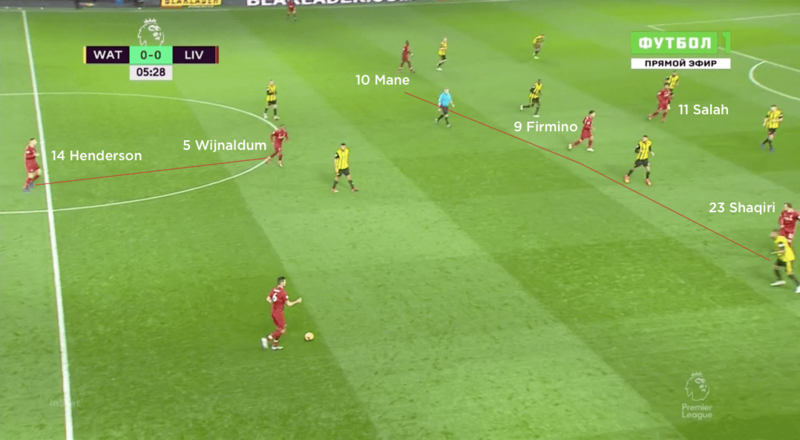 Shaqiri and Firmino would often drop between the lines to try to receive possession and eliminate one of the Watford lines, but they were often well tracked by opposition midfielders Doucoure and Capoue and could only return the ball to their deeper teammates. As Watford protected the central areas, Liverpool tried to exploit the areas behind their full-backs by positioning Trent Alexander-Arnold and Andy Robertson higher and looking to play them in behind – but Watford also managed to defend this relatively effectively. Ultimately, Liverpool’s patience in possession paid off as they looked to create gaps through the Watford defence and eventually got the breakthrough for their first goal, with Mane escaping the attentions of Hughes to play in Salah. 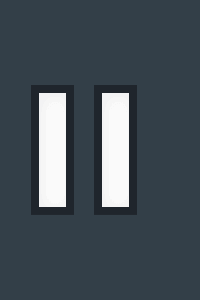 After that, the gaps increased as Watford had to come out in search of an equaliser. Out of possession, Liverpool pressed in a 4-4-2/4-2-4 structure and would look to regain the ball as high up the pitch as possible. Typically, Salah and Firmino would look to show play out wide and discourage a return pass into the Watford centre-backs; then, as the ball went into the full-back, Mane or Shaqiri would close down while Henderson and Wijnaldum squeezed up to reduce the likelihood of a pass into Capoue or Doucoure. 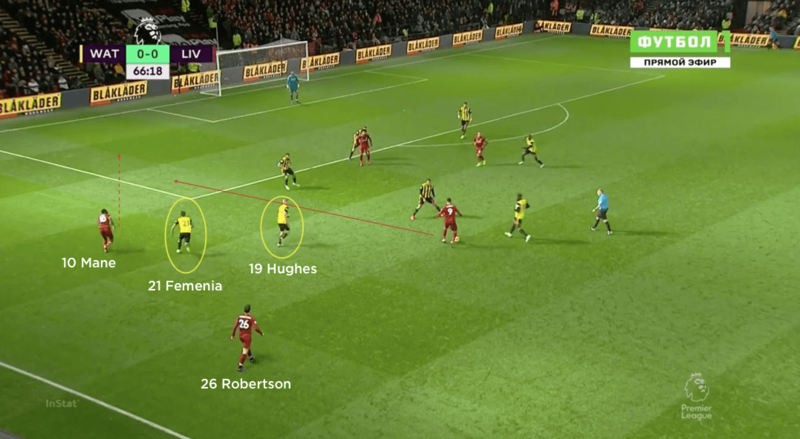 Alexander-Arnold and Robertson would track Hughes and Pereyra, should they look to drop deep, which effectively created a 7-on-6 in Liverpool’s favour in a small area of the pitch. The Liverpool counter-press was similarly effective, with Firmino and Mane regularly recovering the ball almost immediately upon losing possession.  Liverpool would also have players positioned behind the ball when attacking, which meant that when it was cleared the ball would often fall to a Liverpool player who could then simply restart the attack.